A member of the legume family, lupine seeds -- sometimes called lupins or lupini beans -- make a healthful addition to your diet, and you can consume them on their own or use ground, dried lupini beans as a replacement for flour. Eating lupini beans adds nutritional value to your diet because they come packed with fiber, protein, B-complex vitamins and essential minerals. But you should avoid lupine seeds if you have a peanut allergy, since they might trigger an allergic reaction. A 1-cup serving of cooked lupine seeds contains 198 calories, which come from a small amount of fat and larger amounts of proteins and carbohydrates. Each cup of lupins boasts 26 grams of protein, which aids in new cell growth, supports tissue repair and maintains immune system function. A cup of of lupines also contains 16.4 grams of carbohydrates, including 4.6 grams of fiber. This dietary fiber -- 18 percent of the daily fiber intake recommended for women and 12 percent for men -- maintains cardiovascular health and might also aid in weight control. 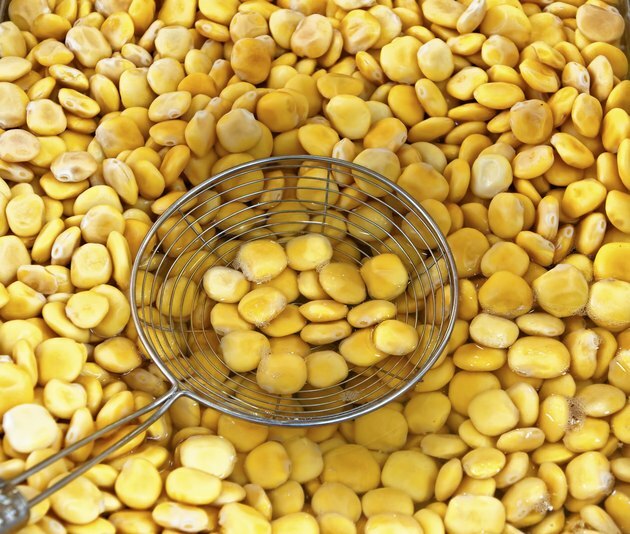 A serving of lupini beans also offers 4.9 grams of fat, which provides energy and helps you absorb certain vitamins. Eating lupins helps you consume more vitamins. They provide a significant amount of thiamin, a vitamin essential for carbohydrate and fat metabolism, as well as maintaining nervous system function. Each 1-cup serving of cooked lupine seeds contains 0.22 milligram of thiamin -- 20 percent of the recommended daily intake for women and 18 percent for men. Lupini beans also offer 98 micrograms of folate per serving, which is 25 percent of the recommended daily intake. Folate helps your cells metabolize proteins and also controls gene activity. Add lupine seeds to your diet as a source of minerals. As a result of its zinc content, lupins promote immune function, and they also aid in reproductive health and regulation of gene activity. Eating a cup of cooked lupini beans boosts your zinc intake by 2.3 milligrams -- 29 percent and 21 percent of the daily zinc intakes set for women and men, respectively. The manganese in lupins neutralizes free radicals, preventing cellular damage, and also supports healthy bone and cartilage growth. A cup of lupini beans provides 1.12 milligrams of manganese, which makes up approximately half the recommended manganese intake for men and 62 percent for women. Opt for lupins as a source of magnesium. Each cup offers 90 milligrams, which makes up 28 percent of the magnesium intake recommended daily for women and 21 percent for men. Consuming a cup of lupine seeds also increases your copper intake by 383 micrograms, or 43 percent of the recommended daily intake. Most of the magnesium in your body works to maintain healthy bone density, while smaller amounts of magnesium support muscle function, contribute to healthy cell membranes and aid in cell signalling. The copper abundant in lupines helps your body process iron, aids in the function of your spinal cord and brain, and strengthens your blood vessels.